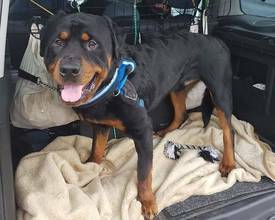 Soul is a 9 year old male Rottweiler who is deaf and is having on-going ear treatment. 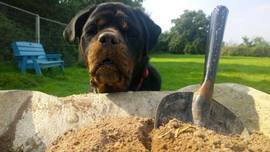 He is NOT up for adoption and is our resident sponsor dog that lives on site. He has huge character and has learnt lots of hand signs just as a deaf person would. 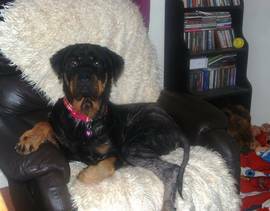 Bonnie is female rottie who has been very badly neglected/abused and has come to us for rehabilitation and health care. With your support we have been able to do extensive surgery on her eyes and get her well again. 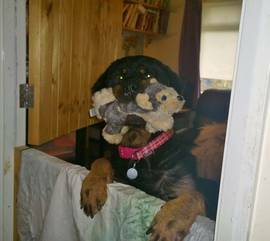 Sadly Bonnie will always have trust issues and is not good with unknown people or dogs. 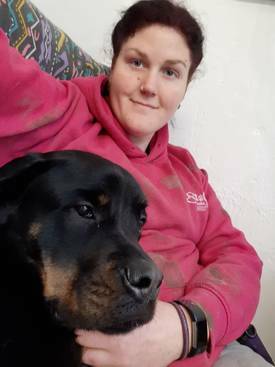 She is another of our sanctuary dogs who will live here and loves playing in the paddock and time with those she trusts and snoozing on her sofa. 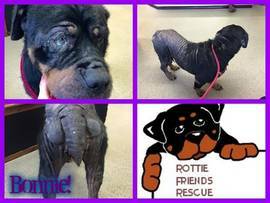 Your continued support allows us to help and care for dogs like Bonnie who are sadly too damaged to re home. Stanley is around 7 years old. He was found as a stray in poor condition with filthy fur. Despite all that he is a friendly chap who likes people and company. He is now clean and healthy and is looking for a loving retirement home. 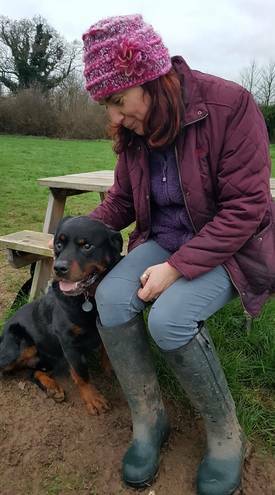 Stanley does not need huge amounts of exercise and would be happy with a nice garden to potter in so could suit a retired person. He can be reactive on lead and does not like other dogs coming too close so a rural home as an only dog without cats is ideal. He loves his ball and toys and company. Could you give Stanley the retirement home he deserves? 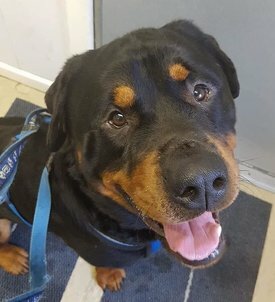 Yogi is a male rottie x aged 3.5 yrs. 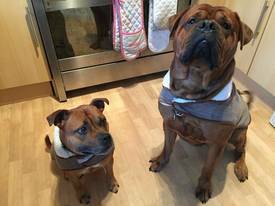 He was rescued as a puppy and came to the UK with his family. Due to changes in circumstance Yogi has sadly come into rescue again. He can be suspicious of new people and is not keen on been touched until he knows you. Once he does know you he is a friendly boy. Yogi has some good obedience and likes working for treats or toys. He has extremely high drive, which means he likes to chase things that move like rabbits and birds. 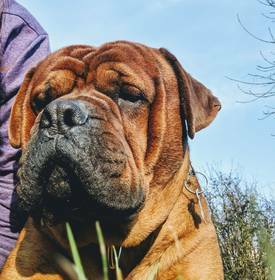 Yogi is looking for an experienced adult home that uses positive methods of training and is not near livestock or farms. He can be selective with other dogs so is best as an only one and could not live with cats or other small animals. 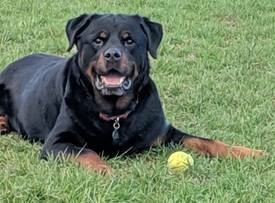 Bozer is a 3 year old rottie/bull dog mix. He is looking for a very specific home, please read his needs and don’t apply just because he looks gorgeous. 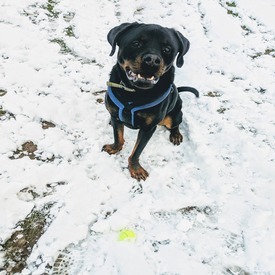 Although Bozer has lived with a Staffie previously he is very reactive on lead and with dogs he does not know due to limited socialisation as a young dog. He will bark, lunge and gets over excited and worried and is very strong. He can also become protective over his items, home and an owner and needs slow intros to new people. He is doing well with positive training and a condition of adoption is that this must continue. 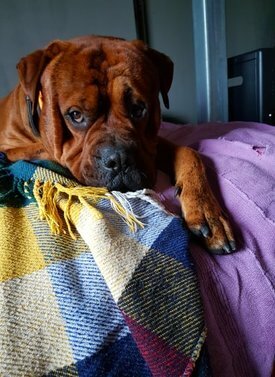 He needs a quiet rural home without cats or children, he could live with another dog after suitable intros and needs a home with someone around as is not keen on being on his own. A home with its own land would be ideal. 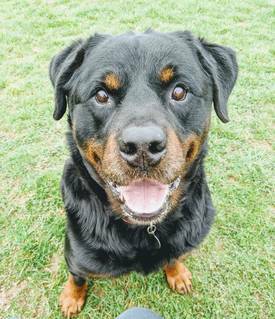 Bozer is affectionate and fun and loves his toys and to run and play. 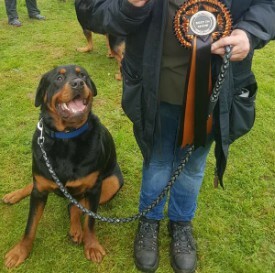 He is looking for a large breed experienced owner who has the knowledge and time to work with him. 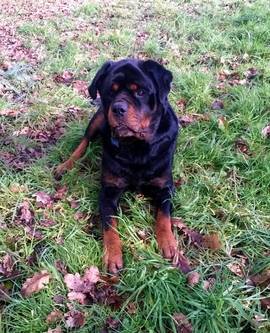 Hugo is around 2 years old and sadly coming back to rescue because his owner in terminally ill. 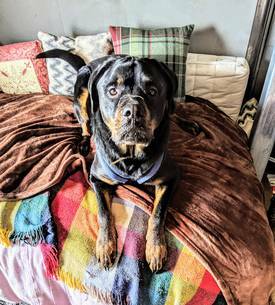 He has lived with a female rottie and could live with another large breed dog after suitable intros. He dislikes small dogs but walks well on a head collar and is muzzle trained. 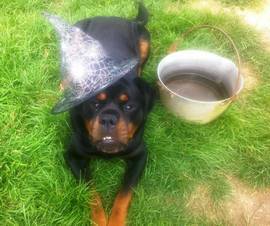 He is currently in Middlesbrough and could be re homed in that area. 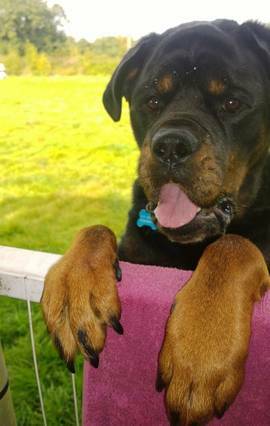 He is a large friendly boy looking for a rural large breed experienced home. No cats or young children.